Because of their policy, tomorrow’s the last day I can return the new backpack for cash if it doesn’t work. So, I spent today actually packing. Everything. Medicines, toothbrush, shampoo and all clothing just to see what it would feel like and determine whether it would all fit. 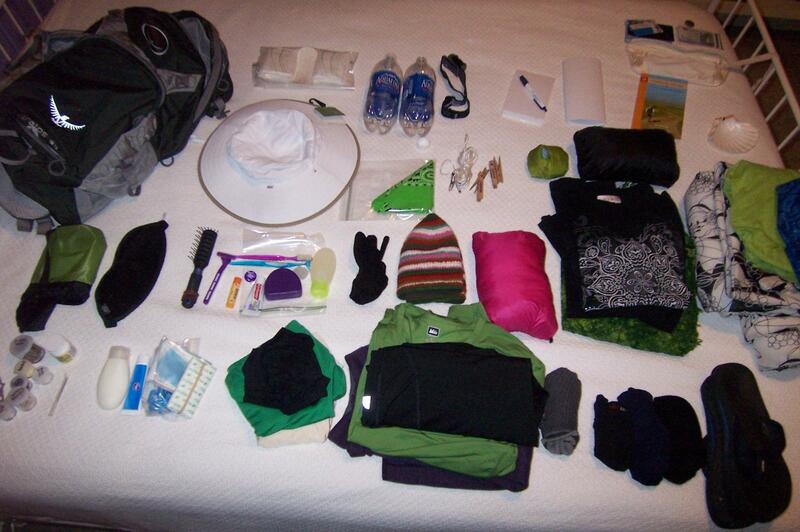 Here’s the entire packing list, spread out on the bed in small piles. 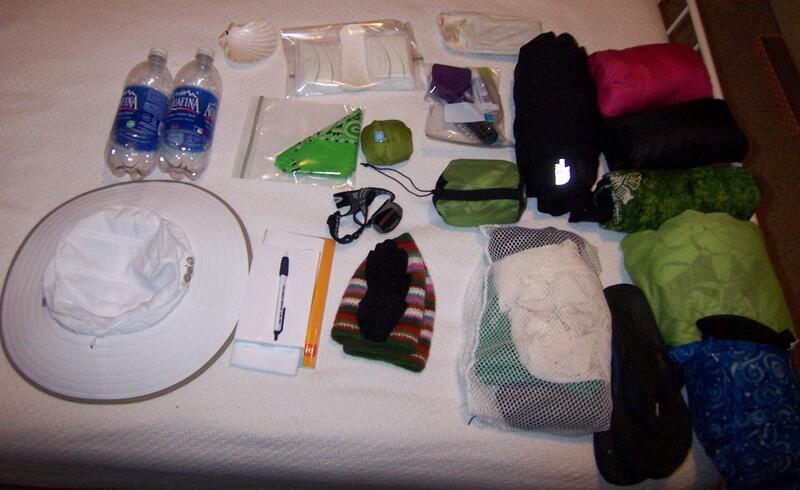 Here is everything all rolled up the way it will be in my pack. At this point, I was crossing my fingers! It’s tight/full, but probably workable. Water will be an issue. 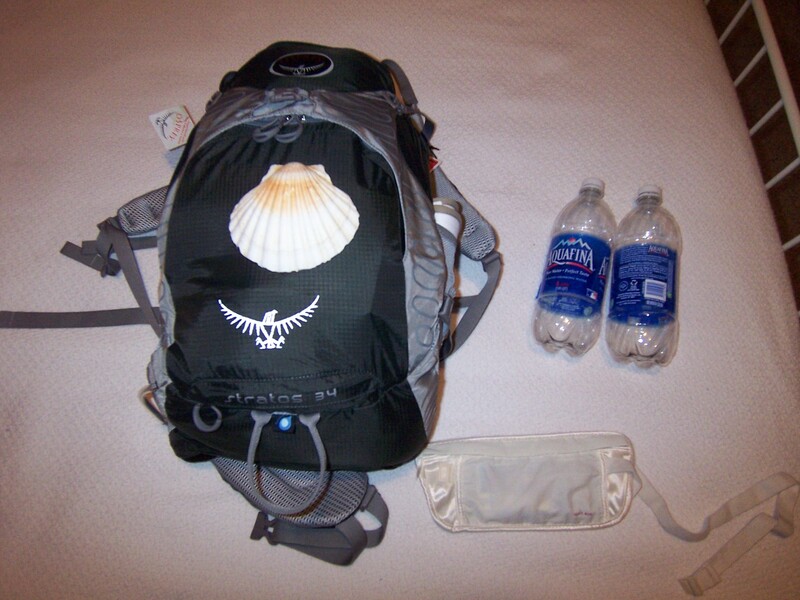 The pack is outfitted with an internal pouch for a water bag and a line, but I’d rather use bottles. When I showed it off to Mary, the Ever-Logical, she asked me where I would put my snacks. (insert screeching sound) Snacks! I can’t do a Camino without a way to carry snacks! I think I need a bigger pack. So off to the store I go tomorrow! Here is my tip Jenn. You never want your pack to full or it will ride like a rock on your back. You may have to resist filling it! A larger pack is also much easier to rummage through which you will be doing a lot of! Let me know if I can help you in your preparation for your journey in any way at all! i vote that you restrain yourself! if you don’t have a ton of snacks, you have a valid reason to stop at the next cafe. you won’t need more than a little snack between cafes, if that. seriously, resist the urge to get a bigger pack. you’ll be glad not to be carrying the extra stuff you’d fill it up with. you’ll probably only want one water bottle, too. lots of fountains along the way. maybe someplace on the meseta you’ll want to buy a second bottle to carry if it’s hot. which would be surprising in early may. osprey makes great packs. this is a good choice. how much did it weigh, full? Considering you’ve done the Camino this helps too! I’m weighing in at 13.5 pounds! Yay! At the mo, it’s the rain gear I’m sorting out – poncho or pants-jacket-pack cover. Weight and volume will be the deal breaker if I keep this pack. Can’t wait to be eating Camino snacks! When do you leave? I can send you my frame pack. It’ll hold all that and a 3 course meal! home for 4 days feb 28, then off again. i can leave it where you can pick it up. I got one a few years ago for those instances when that in-between size is ideal and I’ve never regretted it – it’s lightweight in its own right, and very handy.